Operating daily, Simmo's Offroad Tours offer fun & informative Eco-certified 4WD Tours showcasing the best of the Blue Mountains with pick-up direct from your accommodation in Lithgow, Oberon & Katoomba. Explore rugged 4WD trails to stunning lookouts, sacred aboriginal sites or visit Jenolan Caves. Guests can fish for trout, pan for gold, forage for wild mushrooms, visit a local winery or farm. 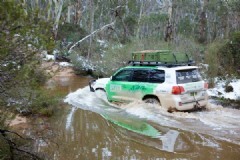 Simmo also offers Camping Adventures and 4WD Tag-a-Long Tours. Simmo specialises in eco-certified 4WD tours, providing private charter tours for small groups - pefect for couples, adventurous families or a group of friends. Simmo's luxurious Toyota Landcruiser comfotably takes up to 6 guests, with buses also availalbe for larger groups on request. Simmo's Offroad Tours has been awarded a prestigious "Certificate of Excellence" by TripAdvisor users for an incredible 6 years running (2013, 2014, 2015, 2016, 2017 & 2018) and has been entered into the Tripadvisor Hall of Fame! Contact me for a personally-tailored 4WD Tour showcasing the very best of the Blue Mountains and Central West NSW. Simmo's Offroad Tours is based in Bathurst, offering pick-up from your accommodation in Oberon, Lithgow, Katoomba or Greater Blue Mountains region. Valid until July 2019, all Scenic 4WD Day tours include a complimentary Aussie BBQ lunch in Blue Mountains wilderness - including Angus beef steaks, Kangaroo rissoles & emu sausage! 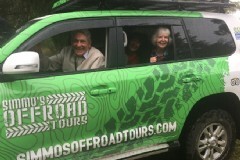 Family friendly, Eco-Certified 4WD Tours, pick up direct from your accommodation in Katoomba, Oberon and surrounds. Get away from the crowds and explore the Blue Mountains by 4WD. A holiday adventure you will remember for a lifetime. Complete your details below and your enquiry will be emailed directly to Simmo's Offroad Tours. Please check your contact details are correct to ensure the quickest possible reply.